How Does Mangoapps Unified Search Work? /Enterprise Search /How Does Mangoapps Unified Search Work? MangoApps support a look ahead search as you type in the search bar. This look ahead search is on the name and hashtags only to give you quick access to a specific post, page, wiki, file, event or person that you’re looking for. What Modules are Searchable in MangoApps? The table below shows which MangoApps modules are searched when specific search options are chosen. 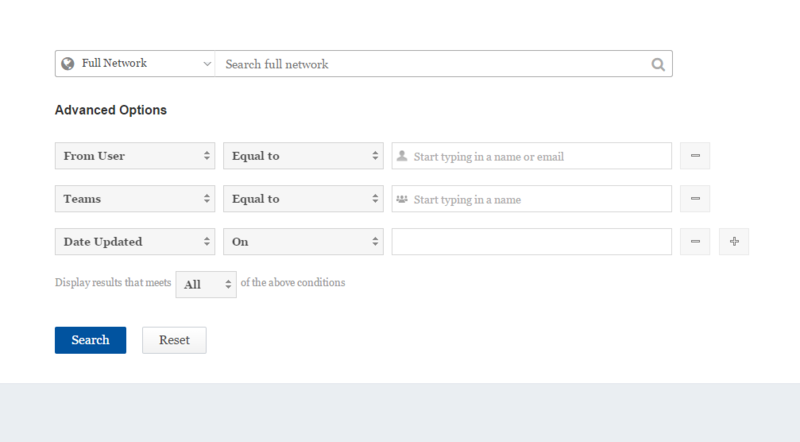 Since “Full Network” is the most comprehensive search, it is shown last in the list because it includes everything in the list for its search criteria. How can advanced search help narrow the search results? “From Users” specifies specific colleagues in your network. “Teams” specifies groups or projects in your network. “Date Updated” lets you choose dates or a date range. “Equal to” means the result set will return search results equal to the User or Team specified. “Not Equal to” will return results that exclude the User or Team specified. “On” means the action occurred within the 24 hour period of the date specified. “Before” and “After” mean that the result set will include matches for any date before or after the date specified, respectively. “Range” allows you to specify a date range to narrow the search results. What Mangoapps Content Can I Find when I Search by Keyword, Colleague Name, Document Name or Group Name Using Unified Search? How Can I See All Possible Search Results Rather Than Just My Search Results? 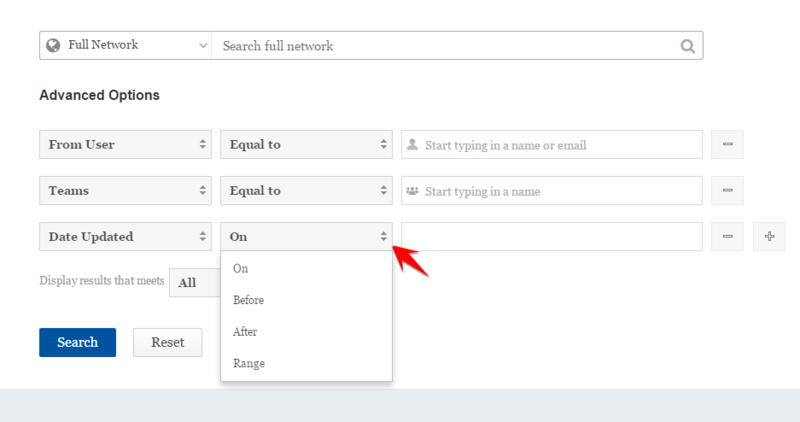 How Can You Quickly Search Through the List of Colleagues Within Your Mangoapps Network? Are Group Messages Accessible Later, Ordered Chronologically, and Searchable?